At an obscure South Carolina nursing home, a lost world reemerges as a disabled elderly woman undergoes newfangled brain-restoration procedures and begins to explore her environment with the assistance of strap-on robot legs. At a deluxe medical spa on a nameless Caribbean island, a middle-aged woman hopes to revitalize her fading youth with grotesque rejuvenating therapies that combine cutting-edge medical technologies with holistic approaches and the pseudo-religious dogma of Zen-infused self-help. And in a rinky-dink mill town, an adolescent girl is unexpectedly inspired by the ravings and miraculous levitation of her fundamentalist friend’s weird grandmother. 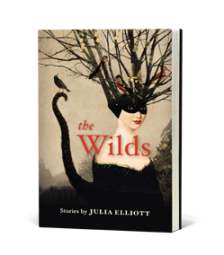 These are only a few of the scenarios readers encounter in Julia Elliott’s debut collection, The Wilds. In her genre-bending stories, Elliott blends Southern gothic strangeness with dystopian absurdities, sci-fi speculations with fairy-tale transformations. Teetering between the ridiculous and the sublime, Elliott’s language-driven fiction uses outlandish tropes to capture poignant moments in her humble characters’ lives. Without abandoning the tenets of classic storytelling, Elliott revels in lush lyricism, dark humor, and experimental play. Published by Tin House Books. Cover illustration by Catrin Welz-Stein.